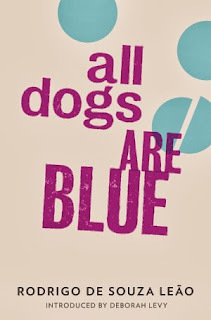 All Dogs Are Blue is a captivating and brilliant stream of consciousness novella about mental illness in a Brazilian asylum. Souza Leao’s semi-autobiographical story is fantastic. Our narrator has been sent to a mental asylum in Rio de Janeiro, as he believes he has swallowed a ‘chip’, which has commanded him to do things he doesn’t really want to do. He has been admitted and put into isolation as he destroyed his family’s home and had to be taken away by the police. The blue pills he is forced to take remind him of his childhood and his toy dog, who was also the same shade of blue. This is also a cheeky nod to the well-known ‘black dog’ which many people use when referring to depression. His strict regime of drugs and electroshock therapy is punctuated by visits from his parents. Each time they bring him cake or tuna sandwiches as a way of making his time in the asylum as comfortable as possible. Their son has pushed them to the limits and they do not really want him moving back into their home. The energetic and bouncy tone draws you into the narrator’s story. At times, the narrator is obsessive and repetitive, telling the same anecdotes but each time he adds more details, each layer makes the story spiral out of control. The reader is dragged into the narrator’s delusions with his imaginary friends and his paranoia of his cellmates. The perception between reality and fantasy are blurred until reader is like the character – unable to tell the difference. Even when the narrator has taken lots of pills, he still has time to be witty and crafty in his behaviour. There is lots of humour within All Dogs Are Blue even when Souza Leao explores the harsh realities of mental illness and life within a Brazilian asylum. The poetic style adds to the contrast between the beautiful language and the stark, sterile atmosphere of the asylum. I would go as far as to say that this book is the Brazilian equivalent of The Bell Jar. I wouldn’t say this lightly as The Bell Jar is one of my favourite books. Both are similar in the way they explore the raw and honest side of mental illness. Just like Sylvia Plath’s novel this novel is also part autobiographical. This adds to the mystery for the reader – which parts are real and which parts are fantasies? All Dogs Are Blue is a fantastic book. This book is definitely on my list of top reads for this year.